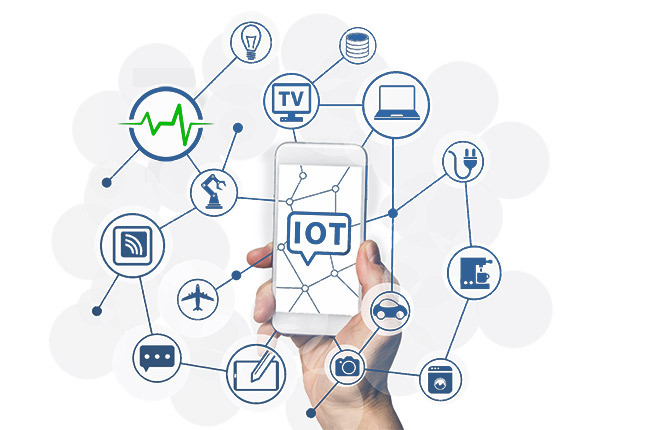 With the Internet of Things concept, we refer to a neologism referred to the Internet extension to the world of places and things. The goal of the connected objects is simplifying our life, by automatizing processes or making available information that we had not before. furnished with home appliances and remote-controlled devices that “talk” in cabled and wireless mode. smart road, able to “talk” with cars, traffic lights and road signals, reducing pollution and travel times. with the Wireless Sensor Network concept (WSN), we indicate a determined web type that, featured by a distributed architecture, is made by an ensemble of autonomic and electronic devices that take data from the surrounding environment and communicate each other. The object interacts with the surrounding world, since it has its own intelligence. Indeed, it finds and transfers information between Internet and the real world. In this way, an electronic identity can be given to all that creates the world and that surrounds usy, through, for example, RFID (Radio Frequency Identification) and other technologies (as the more known QR code). Can we help you in one of these areas? Spiacenti ma attualmente non siamo online, vi risponderemo prima possibile. * Di cosa ha bisogno? In this section, you can download the Teleservice Software. Teleassistance is provided exclusively on your request and with express permission. Once downloaded and executed the Software will generate a code and a password (always different) which have to be communicated to one of our service support technicians. This activity allows our technical department to view images generated by your computer and use your inbound devices (Mouse, Keyboard). You can terminate remote control at any time by closing the Tele-Support Software. In questa sezione avete la possibilità di scaricare un Software di Teleassistenza. La Teleassistenza viene erogata esclusivamente su Vostra richiesta e con espressa autorizzazione. Una volta scaricato ed eseguito il Software verrà generato un codice ed una password (ogni volta sempre differenti) che dovranno essere comunicati ad uno dei nostri operatori del servizio di assistenza tecnica. Questa attività permette al nostro reparto tecnico di visionare le immagini generate dal Vostro Computer ed utilizzare i Vostri dispositivi di Input da remoto (Mouse, Tastiera). In qualsiasi momento potete interrompere il controllo remoto chiudendo il Software di Teleassistenza.